Each sky is different. Yet some remain the same. This is the paradox of the light chaser. Last night on Great Bay Boulevard I welcomed fall. Or spun to the proper hierarchy of things, it was fall who welcomed me. I have no power over seasons and remain her humble servant. It is in accordance to such peerage I will observe my station. Putting the power of things aside it was Mother Sky set in the seat of high honor. This fulfills a trend of quality sunsets in and around seasonal shifts. Confirmation bias may be at play but this seems the case over my now six years of shooting. As I suggested at the start of this story last night’s sky brought me back to a mid-August evening in 2015. The twin skies bore striking resemblance to each other. To further the symbiosis was the location itself. I was also shooting on Great Bay Boulevard at sunset that night. 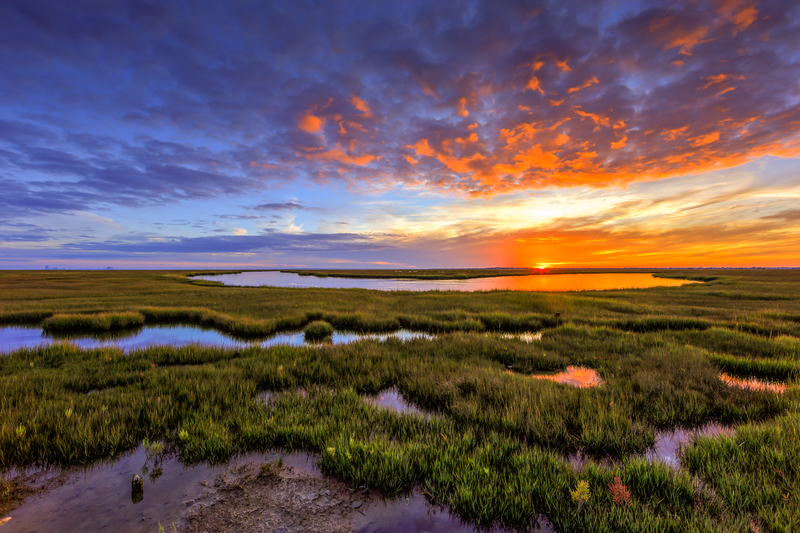 On both occasions the marsh held sway in comparable colors—green pulling back to brown. The sky cast in a clean, piercing blue gaze. All this was set aglow moments before the sun set low beneath the horizon. In a rare showing, low set clouds lit up brief and bright, breathing fire to a scene of peace.